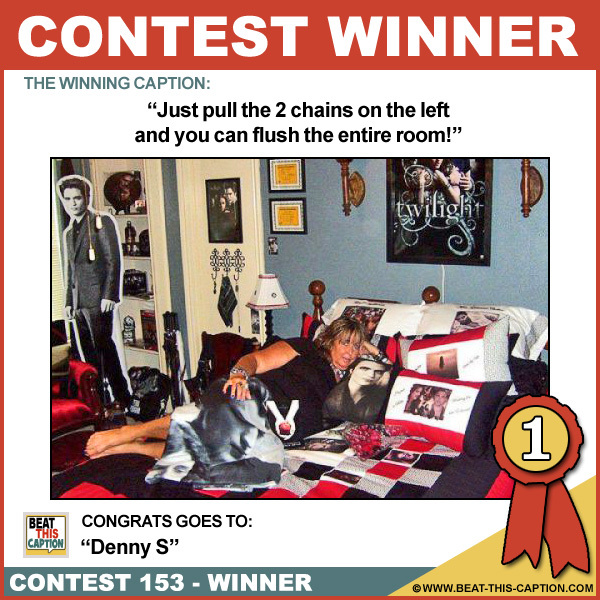 Beat This Caption Contest 153 Winner – Caption Contest Funny Clever Witty Enter Today! Just pull the 2 chains on the left and you can flush the entire room! LMAO! You may need a plunger… Great Caption! :) You WIN! Mom said I can’t leave until I clean my room. Thirty years later, neither of us budged! If you zoom in, turn down the lights, turn up the volume, and look very very closely, you will see that it is not actually Kristen Stewart! Twilight is a pretty good name for an old peoples’ home! Here’s the real reason Ozzy Ozzbourne and Sharon broke up! Just in case this one doesn’t work out, she’s got a Werewolf room across the hall! George Clooney will be featured in my next bedroom makeover!